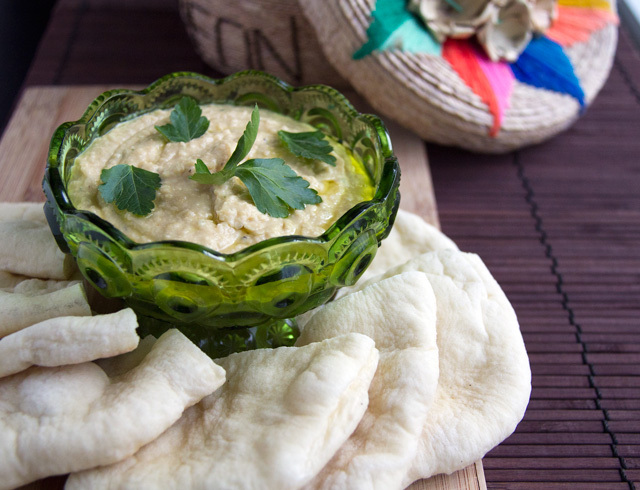 You know we all love a good hummus as a great snack for the kids, us, and anyone who may stop by. It’s a great source of protein, good fats, and just plain good. I hardly ever have tahini on hand so a few years ago when I saw you could sub with peanut butter, I was sold. I always have peanut butter on hand, and so do most people. 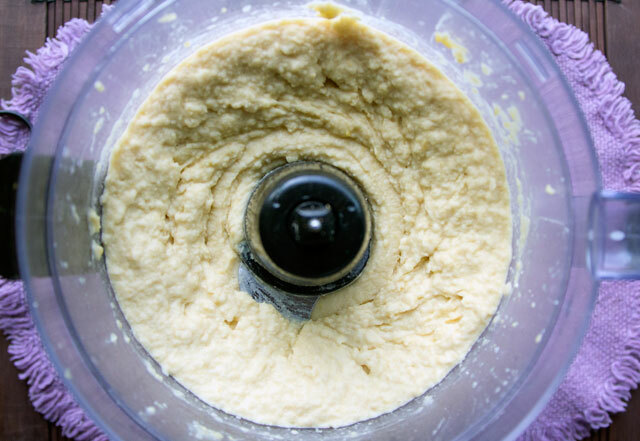 Of course I still enjoy a good hummus with the traditional tahini, this recipe is what I use most often, and it is very tasty. And I love to pair it with a homemade pita, there is nothing like it. But that is a little more work, so for no we will stick with the hummus. We just happen to have made homemade pitas, so I happened to have made some hummus to accompany, it worked out for everyone involved. I used dry chickpeas, soaked over night covered with 2 inches of water, then cooked in a pot covered with water, never boiling but simmer for 30-40 minutes, no salt added. But you are welcome to use canned chickpeas, same amount as the recipe calls for. After cooking, drain them, and then place them in a bowl of water. Let sit for 10 minutes or so. Rub them with your fingers to get the outer coating off, it will float to the top, and you can pick it out. Reserve part of the liquid. 1. 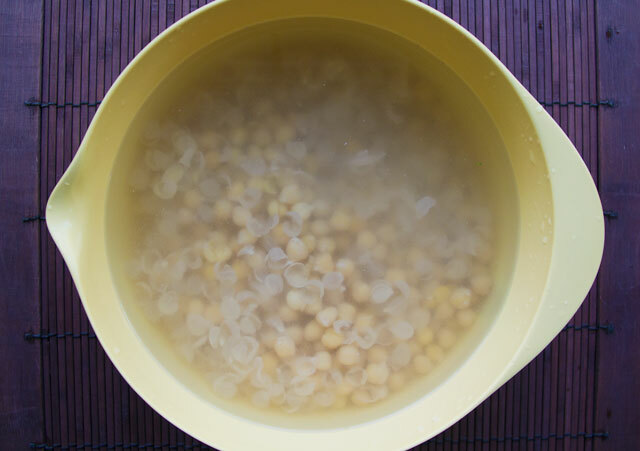 Place canned or cooked chickpeas and 1/3 cup of the liquid, turn on processor, and get to the desired consistency. I let it go for a minute or two because I like creamy hummus, not chunky. 2. 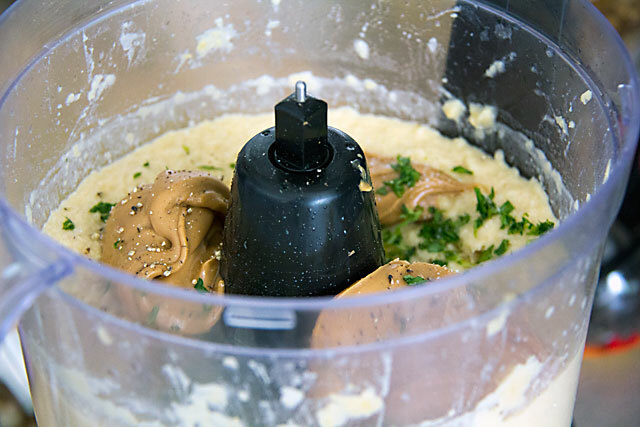 Add the peanut butter, garlic, parsley, lemon juice, pinch salt and pinch pepper, turn on to combine all ingredients. Also leave on for a minute or two until it all comes together. 3. Drizzle olive oil while on until you get the consistency and flavor you like. I used about 1/4 cup of oil. You can add a little more lemon juice or chickpea water if you wan to change the consistency a bit at this point. Add salt and pepper to taste. It is so good Heather!